P-2764. A UNIQUE JALISCO FEMALE KNEELING POT-CARRIER DWARF, AMECA- ETZATLAN STYLE, PROTOCLASSIC, ca. 100 B.C. to A.D. 250. Provenance: Acquired with 4 other objects found together in 1969. They were created by the same hand in antiquity. Please see P-2761 and P-2762. 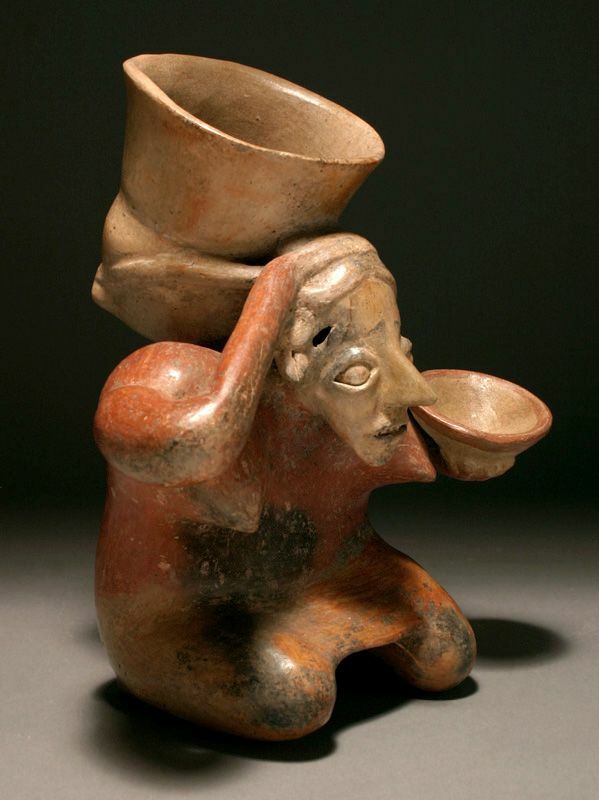 This highly unusual example of a Jalisco female hunchback dwarf is carrying a pot secured by a tumpline across her forehead. She wears a skirt, is decorated with ear-discs and has evidence of facial tattooing. She has massive shoulders, and is pigmented red and cream, with remains of black.